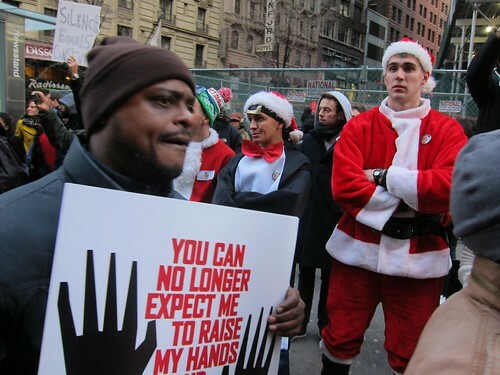 Was SantaCon naughty or nice this year? According to the commanding officer of the 9th Precinct, the annual Red Menace was on jolly good behavior by the time it reached the East Village. The great holiday plague/party SantaCon hit town once again on Saturday, as thousands of festively-dressed bar crawlers descended on the East Village and gleefully got loud and sloppy. While the city waits in terror to find out which neighborhood SantaCon will infect on Dec. 10 (Gothamist claimed Williamsburg, but a source told Patch otherwise), here’s news about a holiday celebration that is not a gushing douche slurry. (Seriously, even Kathy Bates hates the annual gathering of the SantaBros.) The folks at Unsilent Night tell us that the city’s most palatable Christmas event (no offense, Rockettes) will return to the Village on Dec. 17. Ridiculously balmy weather brought record numbers of Santas, elves, ugly sweaters, reindeer, Christmas trees, gingerbread cookies, and Hanukkah shout-outs to Williamsburg and the East Village on Saturday for that most notorious excuse for mass day drinking, SantaCon 2015. Following yesterday’s news that SantaCon will kick off in Williamsburg on Saturday, the Times has gotten hold of the actual itinerary. After the 10 a.m. meetup at McCarren Park, there’ll be parties at Verboten and the Hall, followed by stops at the Delancey and the DL in the Lower East Side and then Solas and Bar 13 in the East Village. With the red menace just days away, the NYPD has issued the above warning shot, and community group L.E.S. Dwellers is encouraging would-be SantaCon participants to donate to charity instead, via multiple versions of the graphic below. Once again, the East Village’s two Christmas traditions, SantaCon and Unsilent Night, are happening on the same day. UnsilentaCon will be upon us Dec. 12! Tens of thousands took to the streets Saturday to protest police brutality, dwarfing earlier demonstrations against the lack of indictments in the deaths of Michael Brown and Eric Garner. Resin-cast doll by Mica Hendricks. With a “day of anger” expected to keep police busy and SantaCon’s organizers asking its drunken devotees to stick to a list of participating bars in Murray Hill and Hell’s Kitchen rather than marauding through the streets, the annual Running of the Santas promises to be a lower-key affair this year (an as-yet mysterious “exciting starting point” will be revealed tonight). But while SantaCon may be playing itself down, Beasticon has come back like a thing possessed. If this flyer is to be believed, SantaCon supporters scorned by Bushwick bar owners will gather at Pearl’s Billy & Social Club tonight “to protect the constitutional rights of a charitable, good-natured right to assembly.” But is it to be believed?